I love craft and I am so happy to find your site and your being so open to share ideas. I love working with kids and it's my hobby this way too. So any ideas and suggestions and tools I can get ahold of in this part of the world (Hyderabad-India) will greatly be appreciated. I can also market your tools here. What do you think? Thank you for your kind words. It's great to find fellow crafters all over the world, isn't it. I am glad you find inspiration here at PaperCraftCentral :) I think some of my favourite kid's craft ideas are on the 3d papercraft ideas pages. 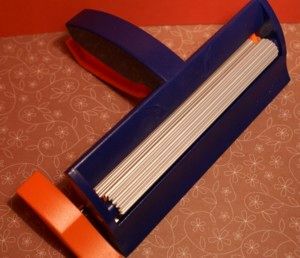 I have a lot of information about papercraft tools and their use here on the site and occasionally offer things to the international market on my Craft Store pages. I'm so sorry but Stampin' Up! (my supplier) is not yet offered in India and the company has a policy of only selling within the boundaries of the countries it is established in. Sad, but we must work within the rules! I sell Big Shot machines here, but no Cricut items. I'm confused about your website and Newsletter. I received your current newsletter that advertises Cricut cartridges for $15 for Black Friday. A friend of mine is interested in ordering some of these but we can't figure out how to do the ordering. Could you enlighten me on this subject? Oh dear I am confused about this offer too. I did not send one out, I'm afraid. I don't sell Cricut cartridges at all and we don't have Black Friday sales in Australia that I know of. I do sell Big Shot machines and dies and embossing folders, but no Cricut products at all. Perhaps double check where the newsletter actually originated? My newsletter is called "Paper Twists" and I always put that in the headline too. I hope you can work out who wrote. My work desk during card construction! I looked at the video for the tools that you use for card making and you mentioned a stylist (hope that is the correct spelling) I have looked high and low and can't seem to find one. Where can I get it? Thank you for your inquiry. I am not sure which video you have watched though and am not sure what a stylist is either. Lol! Let's see if we can work it out. 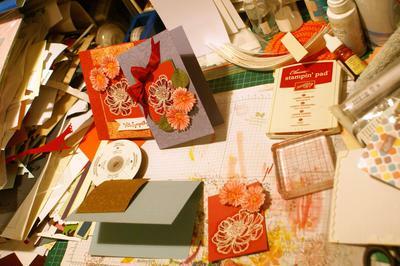 Suggestion one: I have some pages about some of the papercraft tools I use in cardmaking and scrapbooking. Is it pictured on any of those pages? Suggestion two: Could you give me some more details about how the tool you are after is used? What was I doing in the video you saw? I think if I knew what you saw me doing, then I might be able to identify the tool you are after. Suggestion three: Which page on this site did you see the video? I could go to that page and watch the video and see if i can tell what you are after. I would like to know if you ship your supplies to Ghana, Africa. I would like to order some of your stuff and would like to know if it can be delivered to my country, Ghana. Unfortunately, Stampin' Up! does not yet deliver craft supplies to any part of Africa. That is the short answer to your question. I do have some ideas for you though. If you lived in Germany, England, Australia, USA, Canada, New Zealand, Japan, Holland or France, you could receive orders from a Demonstrator there or join Stampin' Up! yourself. Stampin' Up! does have an expanding business mentality, however. I do recommend that you check back with their main business page to see if it does expand into your area one day. You can check the countries where Stampin' Up! has business capability by going to their Home Page and clicking on the blue country button at the top right hand side of that page. That will give you a drop-down menu which shows all the countries they currently have businesses in. I am sorry I cannot help you with craft supplies right now. At present I can only sell to people in Australia itself, as explained on my Shopping page. That is my country. Stampin' Up! has a policy that demonstrators can only sell to people who live in their own country. May you find some craft supplies that inspire you in your own country and please do come back and show us what you make. It would also be good if you told us where you have managed to find craft supplies in Ghana so other readers might be able to buy there, too. Here is another thought. Some Ghanan readers of this post might have suggestions about how to find craft supplies in Ghana. If so, please do make a comment on this page, dear readers. Tell us of stores that stock craft products in Ghana. Don't give up on the idea of crafting, Collins. You can often make beautiful things from recyclable items too, even if there are no craft suppliers near you. If you have a specific question about how to make something in particular, come back and ask more questions. It may be that I can suggest a way to achieve the effect you are wanting without having to have specific supplies. One of Guy's geometric cards showing the slits he is talking about. Hi, I was searching for a specific item, and then got lost in your site. So many ideas and explanations. Fantastic! Anyway, the thing I was looking for is such a simple product that I'm shocked I can't find it anywhere. I am trying to find a corner punch that make a single simple cut, diagonally, 1cm from the edges. Like a photo slit. You can see what I do at https://www.etsy.com/shop/Ullagami?section_id=15641616 and you might notice that all the models are slitted into the four corners of a backing card... I want an easy way of automating those corner slits. There are thousands of frilly, lacey, roundy, corner punches out there, but I can't find any that make just a simple straight line. Do you know of anywhere I can find this, or else might you know anything about how to get custom corner punches made to order? Thanks again for all your enthusiasm and expertise. Thank you for your positive comments about www.papercraftcentral.com. It's nice to know you found a lot of good ideas and projects on my site. I had a look at your work on Etsy and it is stunning. I left your site link in (I normally don't do that for sites that are selling a product) so others can see your work. It's a personal choice of mine to add site links like yours. As for your question about slit corner punches, I am afraid I do not know of a punch that makes such a shape right now. What I can suggest is that you make yourself a template to slip over the corner of your project to allow you to use a craft knife to accurately cut the same slit in each corner. You can make the template from an acrylic sheet. Make it a square shape so you can then make a slit in it that will last awhile. Measure where you want to have the slit punched, then make your cut in the acrylic.I would then use a pencil to make each corner slit before using the craft knife to cut them across. If you want to have card bases on hand in bulk, I know you can probably get various sizes of photo display cards from stationers and paper companies. I am not sure which ones exist in Scotland so you might like to check out the local businesses near you. Then you would have card bases all ready to go, anytime, without the need for a punch or a template. Of course, someone else who is reading this may have another suggestion, so let's invite anyone who knows of another method you could use to make a comment. I hope you can find a good solution. Let me know if you do. Enquiry for Brayer with Concave Rubber Roller. Wonder if you can help as to who might be able to supply & ship internationally to New Zealand? We wish to replace a Speedball Hard Rubber Concave Brayer - width of roller 70mm & diameter at roller ends 30mm. 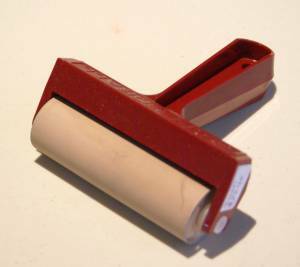 I could email a photo of this existing roller if this would help. The only brayer suppliers I know of in New Zealand are Stampin' Up! demonstrators. You can find one nearest you by searching this site. Then you would not have to have brayers shipped internationally. Otherwise, I would try one of the larger craft and hobby stores. I have no affiliation with any of them so cannot tell if any do ship internationally. Perhaps another reader could advise Jim further? Oh, and the Stampin' Up! brayers do not have the word 'concave' in them so I am not sure if this item will suit? I was hoping to purchase 1 crop-a-dile to make name tags for my guests at my wedding. Do you have any in stock at the moment and how much will it cost? Also I was wondering if you sell eyelets as well or do you know any craft stores in Sydney that might sell them? Thank you for your inquiry. I must apologise about the Crop-A-Dile. It is no longer available through Stampin' Up! and they have no eyelets now either. I know you will be able to find one at a scrapbooking or craft store, though, or even on eBay. I am not sure which store to recommend as I do not live in the Sydney area, but I found all sorts of scrapbook stores listed in the Sydney area when I typed 'scrapbook' into White Pages online. I have updated the page about Crop-A-Diles on the site so it no longer shows it is available through Stampin' Up! The current Stampin' Up! catalogue can be viewed online, and there are so many other amazing and new things in it, perhaps you will find another item or two I can help you with. PS: You may also be interested in these wedding cards, wedding easel cards or this simple wedding card idea. I would like to purchase your stamp positioning tool please! I live in the UK and have only just seen it on your site this morning. Oh and you can also watch a video to see how to use this wonderful tool. It really is helpful for making accurately placed stamped images. I hope this information helps. Please let me know how you get on with contacting a Demonstrator in the UK. And thank you for your support of PaperCraftCentral.com :) I trust you will come back and see what is happening here. PS: If any Aussie crafters would like a Stamp-A-Ma-Jig, contact me to order item code no 101049. They cost $21.00 each plus $5.95 postage and handling and can be delivered directly to your door. Or click on the catalogue link to SusanSalutations on practically every page of PaperCraftCentral.com and order one from there. How can buy the tools ? Can I buy from you ? thanks. Please email me for reply. There is a drop-down menu at the top right of the page that lists the countries Stampin' Up! sells within. I agree, the tools Stampin' Up! in Australia have are very good and I would love to be able to supply them to you. Maybe one day! I would like to get information on how to buy one of the paper crimper tools. Do you sell these? Yes, I do sell great Stampin' Up! 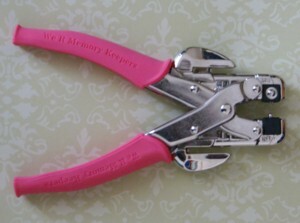 paper crimpers to customers who live in Australia. They are very good at turning paper and card into corrugated conditions, and I also use mine for adding details to packaging, for example, and for making veined handmade leaves. They are sturdy instruments, too. You can see details about this wonderful tool on page 148 of the Idea Book and Catalogue - item #101618. The cost is $AUD37.95 plus $AUD5.95 (only within Australia) for postage and handling. The total for your order would therefore be $AUD43.90. PS: You may like to read more about Papercraft Tools and their uses.